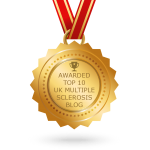 It was double vision that led to my diagnosis of MS in 1994. Twenty years later double vision was turning into a serious problem. 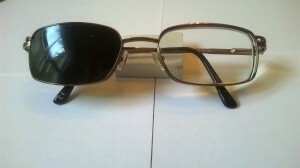 Prisms are included into the prescription and these are then glasses for double vision. The problem for me was that my double vision had reach the stage where prisms could not resolve the problem. It patch worked but I had to wear it over my glasses and it was uncomfortable. If I wore it directly over the eye my eye lashes rubbed against the patch, very irritating. Also I just knew I would feel embarrassed wearing a patch when walking down the street. I did not like the idea that people would stare at me especially children. Maybe I should wear fancy dress and have a cutlass. The double vision was really only an issue when reading so the patch could stay at home, phew no need to mutter ‘pieces of eight under my breath and put a dead parrot on my shoulder. None the less the problem was getting serious; my vision was becoming a liability, especially when I was tired. I was starting to rub my eyes and I’m sure the double vision was to blame. Time for my annual eye check-up in spring 2015. I was told the prisms could not be any stronger. Double vision was now going to be a part of my life. Reading was no longer going to be a pleasure. Looked like it was going to be the patch or a hand over one of the lenses and that would give me grubby glasses. Umm, not a good scenareio. So there I was sitting opposite the optician.He realized that I was a bit despondent about the whole situation. I could see the wheels going round in his head. Suddenly he got up from his chair, selected a pair of glasses and said “I have a solution. We can adapt these glasses and you will not need a patch”. Would this be a ‘light-bulb’ moment? 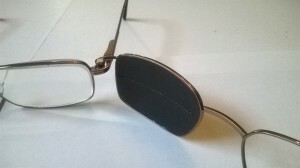 He showed me the glasses and explained that there is an option to have sunglasses attached to the frame using a magnetic point at the hinge for the arm. The sunglasses are a magnetic clip-on frame. Instead of a pair of sunglasses he suggested that I have a frame specially adapted with only one glass lens. Tape over the glass lens with black tape and attach it to the magnetic clips. Hey presto single vision. That is what I call ‘thinking outside the box’ or a ‘light bulb moment’. I now have a pair of glasses for double vision. Do I like them? Yes, so more comfortable and convenient than a patch. They are a talking point. To my mind the most interesting aspect is taking an idea and adapting it to resolve a different problem.